So, I'm a sucker for products with seasonal flavors. Syrups and liqueurs that are pumpkin, gingerbread or eggnog flavored and likely to end up in my shopping cart. Oh, I may pass them by a few times but, ultimately, I'll give in. I can't help myself. 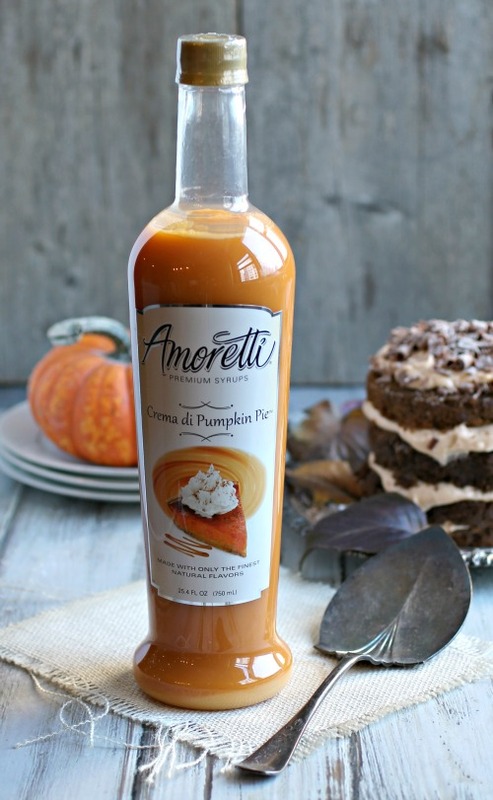 So, creamy pumpkin pie syrup from Amoretti? Yup, it's here. Naturally you can just put that in your coffee all season long and be happy but I see it as a tall bottle of flavor, ready to be added into anything I want to pumpkin-ize. What? It's a technical term. Professional bakers use simple syrups to moisten cake layers which is what got me started thinking about layer cakes. This one is very moist and fudgy so I used the syrup inside the batter instead. Then I wondered what would happen if I used it to sweeten cream cheese as the frosting. Delicious things happen, actually. 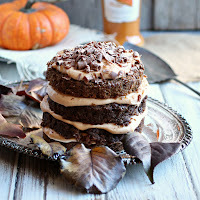 You know I'm not big on fussy cakes but this one is actually pretty easy to make, looks good a little messy (sort of a cake requirement for me) and was a four layer flavor bomb. Seriously, I see myself making this again for Thanksgiving or any other time I have a house full of people who will help me eat it so I don't polish it off by myself. Enjoy! Pre-heat the oven to 350 degrees and butter and flour two cake pan. You can use 8" pans to make a 2 layer cake or 4" pans to make a 4 layer cake. Add the egg and sugar to a large bowl. Using a stand or hand mixer, beat until lightened in color. Beat in the butter, vanilla, pumpkin puree, pumpkin pie syrup and buttermilk. In a separate bowl, sift together the flour, cocoa powder, salt, baking powder, baking soda and cinnamon. Beat the dry ingredients into the wet and pour the batter evenly into the prepared pans. Bake for approximately 30 - 40 minutes or until a cake tester comes out clean. Allow the cakes to cool completely before removing from the pans. If using two smaller pans, slice each cake into two even layers. Make the frosting by beating together the cream cheese, pumpkin syrup, cinnamon and salt until creamy and thoroughly combined. Spread equal amounts of the frosting on each layer of cake and top with shaved chocolate (I used a vegetable peeler to make the curls) and a dusting of powdered sugar mixed with cinnamon. This recipe was sponsored by Amoretti. For more information about all their delicious products, visit them on Facebook, Twitter,Instagram and YouTube. Thank you for supporting the products I love and use in my kitchen. 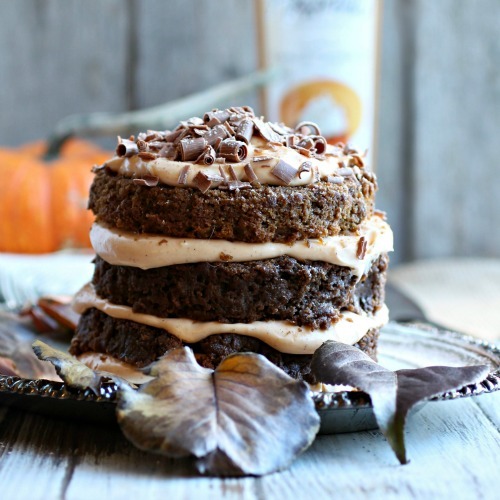 You can buy Amoretti's delicious pumpkin pie syrup as well as all their other products on Amazon. I love naked cakes like this! They look so rustic and approachable. Makes me just want to dive in! 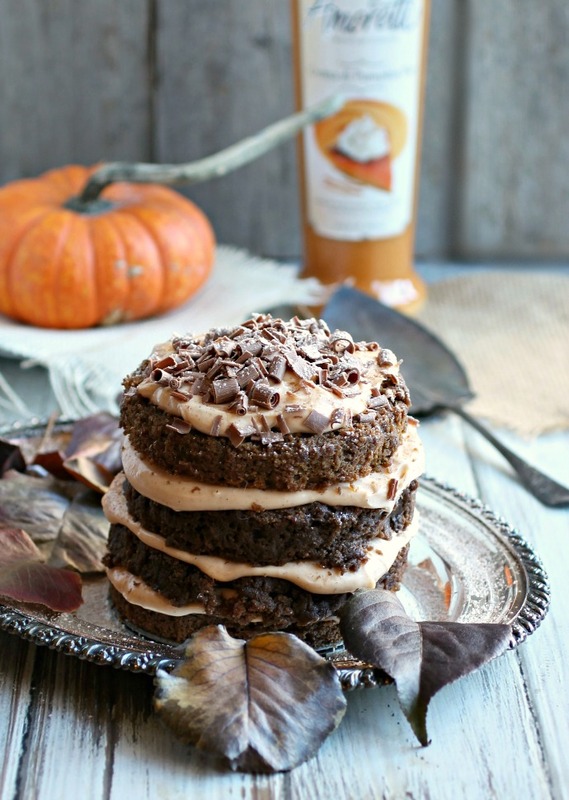 I love chocolate and pumpkin together so you're really tempting me this morning! I love mini cakes because they equal one serving cakes to me ;) Love that you pumpkinized it. I love these tiny cakes because it means I can eat it all and not feel guilty! That frosting looks so dreamy! !